Jimmy, Josie, Lara, Doran, Melba, Angie (youth from Bresee) and I put our heads together and came up the rough scheme for the intersection repair mural that we’ll all be painting on Saturday September 12th. For more information about the event, as some photos of the previous intersection repair mural, see this earlier post. It will have a central circle based on a bicycle wheel. Wrapped around that will be a salamander/lizard. Where the crosswalks go, we’ll be doing lighter colors. 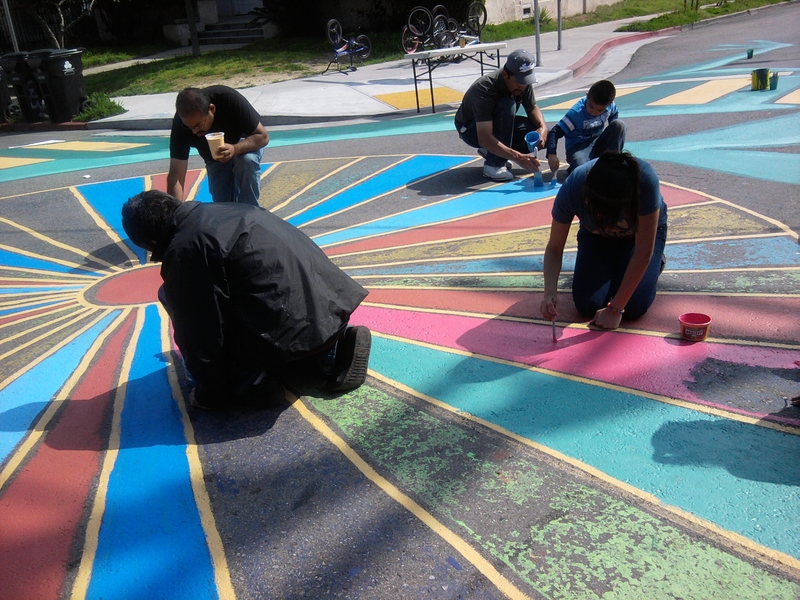 In the crosswalk, participants will paint their footprints. Along the lizard, we’ll be writing welcome in multiple languages (likely at least Spanish, English, Korean, and Bangladeshi.) Extending from this will be stylized swirling pattern representing waters. Most of the details will be worked out in the street in chalk on September 12th. These are blurry cell phone pictures… but perhaps they’re enough to communicate the basic ideas. The actual drawings are taped up in the lobby of 117 Bimini Place. If you have suggestions, ideas, etc., please let us know what you’d like to see.